Aim: The aim of this study is to evaluate the shear bond strength of composite to tooth using different adhesive techniques and rotary instruments under simulated pulpal pressure. Materials and Methods: Sixty extracted human molars were randomly divided into two groups of 30 samples each (group I and II), according to the adhesive technique followed (i.e. total etch and self etch groups). Each group was further divided into two sub-groups (Sub-groups A and B) of 15 samples each according to the cutting instrument (diamond abrasive or carbide burs) used. Class II cavities were made with diamond abrasive or carbide burs, and restored with nano-composite under positive intra-pulpal pressure. Shear bond strength of the specimens were recorded simultaneously. Results: After statistical evaluation using two-way ANOVA and t-test, the mean shear bond strength values of the groups are as follows: Group IA- 4.69 MPa, Group IB-6.15 MPa, Group IIA-4.3 MPa, and Group IIB-6.24 MPa. It was seen that group IIB showed highest bond strength followed by group IB. Group II A showed the least bond strength. Conclusions: Within the limitations of the study, diamond abrasive gave better bond strength than carbide bur with both the adhesive techniques. Durable adhesion of adhesive materials to tooth substrate is indispensable for clinical success. Even though adhesive technology has made a significant progress, numerous questions still remain unanswered. Clinicians generally use high-speed diamond and carbide rotary instruments to prepare cavity designs for adhesive restorations. Statistically significant differences in the resin-dentin bond strength were noted earlier with the use of these instruments. ,,, Therefore, information on the effects of cutting tooth with different rotary instruments on resin-dentin bond strengths is essential. On the other hand, the thickness and the density of the smear layer created with bur or diamond abrasive have been reported to affect the bond strengths when total-etch and self-etch strategies were used. ,,, Hence, it is still unclear whether the cutting instrument or bonding technique is the crucial factor in resin-dentin bond strength determination. Clinically, dentin is an intrinsically hydrated tissue. The flow of fluid from the pulp to the dentino-enamel junction is the result of a slight but constant pulpal pressure. Although the flow along individual tubules is very small, this is sufficient to oppose and greatly reduce the inward diffusion of the resin. Hence, fluid movement in dentinal tubules plays a major role in determining the bonding. We aimed to evaluate the shear bond strength of composite to tooth by using different adhesive strategies and rotary instruments with simulated pulpal pressure in this study. Sixty freshly extracted, noncarious human maxillary and mandibular molar teeth with divergent roots were collected. Teeth free from caries, occlusal wear, sclerotic dentin and calcifications in the pulp chamber were selected for this study with the help of radiographs. All the specimens were cleaned to remove the adhering soft tissue or calculus and stored in distilled water which was periodically replaced. All the teeth were kept under positive hydrostatic intra-pulpal fluid pressure via pulp chambers filled with distilled water during tooth preparation and bonding procedures to simulate the clinical conditions. To create this mechanism, a hole of 4 mm in diameter was made in the furcation area of the teeth, between the roots. The roots were covered externally by one end of the rubber tube while the other end was connected to a plastic tube. The other end of this plastic tube was connected to a water-filled 2-ml plastic syringe. The junctions of the rubber tube and tooth, rubber tube and plastic tube, tube and syringe were sealed using cyanoacrylate glue and epoxy putty to maintain an air-tight seal of the water column. The teeth and the syringes were fixed to two thermocol pieces, which were in turn held in position by four burette holder stands. , The column height of water was adjusted to 34 cm to provide approximately 25 mm Hg of pressure, which is the average tissue pressure in a healthy pulp. , Intra-pulpal fluid pressure was maintained during tooth preparation and restoration. The specimens were divided into two groups based on the bonding technique used. Each group was further subdivided into two subgroups based on the rotary instrument used. This study evaluated the bond strength of composite to enamel and dentin. 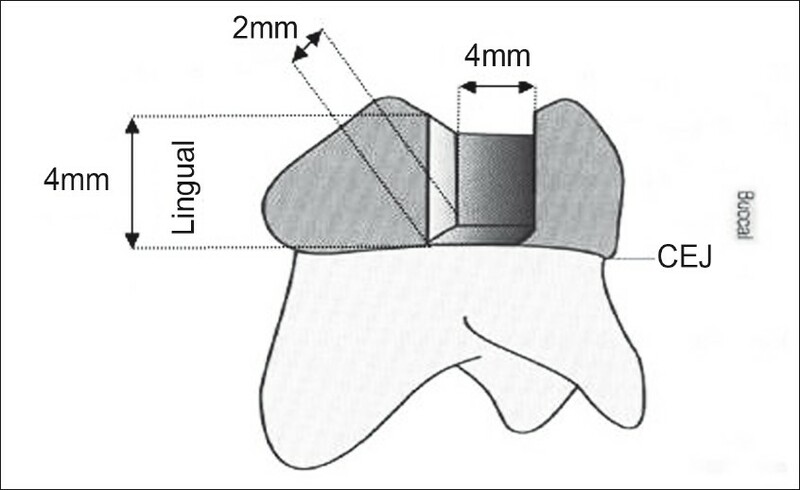 Class II proximal box-only cavities of standard dimensions, 4 mm bucccolingual, 4 mm occlusogingival and 2 mm mesiodistal, with facial and lingual walls straight and parallel to each other, were prepared [Figure 1]. The standard dimensions included both enamel and dentin surfaces. In all the groups, the tooth surface was prepared under copious water spray with a high-speed air turbine (150,000 rpm; NSK, Nakanishi Inc., Tochigi-ken, Japan). Handpiece was handheld to simulate the clinical conditions. Each bur/abrasive was changed after preparing five cavities. Teeth in Group IA and Group IIA were prepared using diamond abrasives and teeth in Group IB and Group IIB were prepared using carbide burs. The prepared enamel surface was etched with 36% phosphoric acid (DeTrey Conditioner 36, Dentsply, DeTrey, Germany) for 20 seconds. Two coats of adhesive resin, XP BOND Universal Total-Etch Adhesive (DENTSPLY, DeTrey, Germany), were then applied with an applicator tip and then photopolymerized using a light intensity of 600 mW/cm 2 for 10 seconds. The prepared surface was treated with two coats of the bonding agent, XENO V (Dentsply, DeTrey, Germany) and photopolymerized. In this study, no attempt was made to deviate from the manufacturer's instructions. The proximal box was restored using a nanoceramic composite (Ceram X Mono Dentsply, DeTrey, Germany), placed in 2-mm thick horizontal increments. The last layer was flushed with the enamel cavosurface margins. Each layer was photocured for at least 40 seconds from the occlusal side. As tooth preparations are commonly performed on dentin and enamel simultaneously in clinical situation, it is important to determine the effect of rotary instruments over adhesive bond strengths of enamel as well as of dentin. Hence, in the current study, total bond strength values obtained by composite to both enamel and dentin surfaces were evaluated. Specimens were removed from the assembly apparatus and mounted in plastic cylinders for loading at an angle of 45°. This angle is important because the load applied at 45° angle stimulates high shearing stresses. , The mounted specimens in the rings were stored in distilled water until testing was performed. Bond strength between the restorative materials and tooth surface was measured in the shear mode with the Universal Testing Machine (Lloyd- Bangalore, India) . The specimens were mounted in a jig, while a straight knife-edge rod (2-mm wide) was applied at the tooth-restoration interface at a crosshead speed of 2 mm/minute. This resulted in a shear force at a 45° angle to the tooth surface. Load was applied until the restoration failure occurred. Bond strength was recorded in Newtons. The total bonded surface area of the proximal box cavity preparation was 40 mm 2 , and it was calculated as the sum of the surface area of the gingival wall (8 mm 2 ), facial wall (8 mm 2 ), lingual wall (8 mm 2 ) and axial wall (16 mm 2 ). Loads were converted to megapascals by dividing the loads in Newtons by the total bonded surface area. Results were subjected to statistical analysis using two-way analysis of variance (ANOVA) and t-test at 95% level of confidence to know the effect of rotary instrument and adhesive technique (independent variables) on the bond strength (dependent variable). In this study, P < 0.001 was considered as significant. In the experiment, failure generally occurred as a combination of the following three modes: 1) fracture of the tooth structure, 2) fracture of restoration and 3) dislodgement of restoration. Thus, failure was never purely adhesive or purely cohesive, but of mixed type. The mean bond strength and standard deviation values are presented in [Table 1]. [Table 2] shows the statistical analysis (ANOVA) of difference in shear bond strength in between groups. [Table 1] shows that the mean shear bond strength values ranged from 4.30 to 6.24 MPa. Group IIA recorded the highest bond strength of all the groups. Group IIB gave the lowest bond strength of all the groups. Diamond abrasive showed the greatest values of bond strength with the adhesive techniques and was statistically significant compared to carbide bur. Total-etch group gave better bond strength over the self-etch group, but was not statistically significant. [Table 2] shows that adhesive technique is not a significant factor influencing the bond strength. There was no significant difference between total-etch and self-etch bonding agents (P > 0.05). Rotary instrument was found to be a significant factor influencing bond strength. Statistically significant difference was observed between carbide and diamond rotary instruments (P < 0.05). The interaction (joint effect) of adhesive technique and rotary instrument on the bond strength is not statistically significant (P > 0.05). Adhesives are routinely tested for bond strengths via in vitro tests, prior to the commercialization, as these methods provide immediate results. These laboratory studies are generally performed on flat tooth surfaces [have most favorable configuration factor (C-factor)], prepared by using silicon carbide abrasive papers. Unlike in clinical situations, com­plex cavity designs are prepared using diamond abrasives or carbide burs. Another drawback of these bond strength studies was that they had been conducted without maintaining intra-pulpal pressure during bonding. Clinically, in contrast, dentin is an intrinsically hydrated tissue. Hence, the experimental setup and methodology of the current study was designed to overcome these drawbacks and to mimic the clinical situation. The bonded surface area is extremely important in determining the bond strength as fracture strength is measured per unit area. Bond strength is inversely proportional to cross-sectional area of bonded specimens. This may explain why the bond strength results in the present study were lower than the results obtained in studies where smaller dimension bonding surface had been used. The frictional stresses, along with plastic and elastic deformation of tooth, during mechanical tooth preparation result in formation of an amorphous layer of organic and inorganic debris called smear layer. This smear layer covers the dentin surface, adheres weakly to the underlying dentin and occludes the entrance of the dentinal tubules. As a part of restorative procedure in adhesive dentistry, the smear layer should be either removed with phosphoric acid (total-etch technique) or modified with acidic primers (self-etch technique). After statistical evaluation, results concluded that the diamond rotary instrument gave a higher bond strength compared to the carbide rotary instrument with both the adhesive techniques. Diamond abrasive cuts the surface by abrasion, while carbide bur cuts the surface by the cutting action of blades. Earlier studies , have concluded that the diamond abrasive creates a thicker smear layer and a rougher dentin surface with deeper and uniform grooves, when compared to those created by the carbide bur. Hence, the rougher surface created by the diamond abrasives would have increased the surface area and facilitates better infiltration of the adhesive resins, resulting in better bond strength than carbide. Based on the current adhesive techniques, there are two major approaches to produce an effective bond between resin and dentin. Etch and rinse systems employ phosphoric acid to remove the smear layer, followed by primer/adhesive applications. On the other hand, non-rinsed self-etch systems utilize acidic monomers to modify the smear layer. The subsequent bonding process incorporates this modified smear layer within the resin-dentin bond. Earlier studies , have reported that when total etch technique was used, bond strength of dentin was influenced by the rotary cutting instrument. They conclude that topography of the dentin surface after removal of the smear layer and demineralization of the dentin would reflect the coarseness of the abrasive and the coarser abrasives would increase the surface area. Hence, it would be reasonable to assume that in the current study, the roughness created by the diamond abrasive must have influenced the bond strength with total-etch technique, resulting in higher bond strength. On the other hand, some studies , have concluded that the bond strengths of the self-etch system are influenced by the thickness of the smear layer. They concluded that the self-etching primers produce less etching because of their relatively high pH (>2). This leads to compromised smear layer removal, demineralization of the underlying dentin and further penetration of the adhesive resin, resulting in poor bond strength. On the contrary, this study showed higher bond strength of composite with diamond rotary instrument (thicker smear layer) than carbide bur (thinner smear layer) when bonded with self etch technique. Probable explanation for such contradicting result was explained by Spencer et al. His study concluded that carbide bur creates a fibrous smear layer composed of well-arranged and undisturbed collagen fibrils. This smear layer might not be as easily dissolved by acidic monomer when compared to thick smear layers created by diamond abrasives. However, further micro-morphological and chemical studies of resin-dentin interfaces, as related to different surface preparation methods, are required to clarify this issue. Apart from the initial bond strengths achieved in this study, unimpregnated collagen and smear debris of hybrid layer could affect the long-term bond strength and raise concern regarding the longevity of restorations. Further research is required, as this study did not confirm the reliability of results based on scanning electron microscope (SEM) analysis, which could have greatly helped in studying the fracture modes, micro-morphology of both smear layer and hybrid layer and surface topography of the substrate after tooth preparation. It may be difficult to compare the results of the current study to those of previous studies, as these studies were not done under same experimental conditions. Rotary instrument was found to be a significant factor influencing bond strength. 1. Dias WR, Pereira PN, Swift EJ Jr. Effect of bur type on microtensile bond strengths of self-etching systems to human dentin. J Adhes Dent 2004;6:195-203. 2. Gupta R, Tewari S. Effect of rotary instrumentation on composite bond strength with simulated pulpal pressure. Oper Dent 2006;31:188-96. 3. Sattabanasuk V, Vachiramon V, Qian F, Armstrong SR. Resin-dentin bond strength as related to different surface preparation methods. J Dent 2007;35:465-75. 4. Marques MS, Kenshima S, Muench A, Ballester RY, Rodrigues Filho LE. Effect of the C-factor and dentin preparation method in the bond strength of a mild self-etch adhesive. Oper Dent 2009;34:452-9. 5. Tao L, Pashely DH, Boyd L. Effect of different types of smear layers on dentin and enamel shear bond strengths. Dent Mater 1988;4:208-16. 6. Finger WJ, Manabe A, Alker B. Dentin surface roughness vs bond strength of dentin adhesives. Dent Mater 1989;5:319-23. 7. Koibuchi H, Yasuda N, Nakabayashi N. Bonding to dentin with a self-etching primer: The effect of smear layers. Dent Mater 2001;17:122-6. 8. Rocha PI, Borges AB, Rodrigues JR, Arrais CA, Giannini M. Effect of dentinal surface preparation on bond strength of self - etching adhesive systems. Braz Oral Res 2006;20:52-8. 9. Brannstrom M, Linden LA, Johnson G. Movement of dentinal and pulpal fluid caused by clinical procedures. J Dent Res 1968;47:679-82. 10. Stead WJ, Orchardson R, Warren PB. A mathematical model of potassium ion diffusion in dentinal tubules. Arch Oral Biol 1996;41:679-87. 11. Nikaido T, Burrow MF, Tagami J, Takatsu T. Effect of pulpal pressure on adhesion of resin composite to dentin: Bovine serum versus saline. Quintessence Int 1995;26:221-6. 12. Mitchen JC, Terkla LG, Gronas DG. Bonding of resin dentin adhesives under simulated physiological conditions. Dent Mater 1988;4:351-3. 13. Van Hassel HJ. Physiology of the human dental pulp. Oral Surg Oral Med Oral Pathol 1971;32:126-34. 14. Summitt JB, Della Bona A, Burgess JO. The strength of Class II composite resin restorations as affected by preparation design. Quintessence Int 1994;25:251-7. 15. Yaman SD, Yetmez M, Turkoz E, Akkas N. Fracture resistance of class II approximal slot restorations. J Prosthet Dent 2000;84:297-302. 16. Feilzer AJ, de Gee AJ, Davidson CL. Setting stress in composite resin in relation to configuration of the restoration. J Dent Res 1987;66:1636-9. 17. Yoshikawa T, Sano H, Burrow MF, Tagami J, Pashley DH. Effects of dentin depth and cavity configuration on bond strength. J Dent Res 1999;78:898-905. 18. Bouillaguet S, Ciucchi B, Jocoby T, Wataha JC, Pashley D. Bonding characteristics to dentin walls of class II cavities in vitro. Dent Mater 2001;17:316-21. 19. Pashley DH, Carvalho RM. Dentine permeability and dentine adhesion. J Dent 1997;25:355-72. 20. Ozok AR, Wu MK, Wesserlink PR. Comparison of the in vitro permeability of human dentin according to the dentinal region and the composition of the simulated dentinal fluid. J Dent 2002;30:107-11. 21. Mitchem JC, Gronas DG. Adhesion to dentin with and without smear layer under varying degrees of wetness. J Prosthet Dent 1991;66:619-22. 22. Pioch T, Staehle HJ, Schneider h, Duschner H, Dörfer CE. Effect of intrapulpal pressure stimulation in vitro on shear bond strengths and hybrid layer formation. Am J Dent 2001;14:319-23. 23. Pashley DH, Sano H, Ciucchi B, Yoshiyama M, Carvalho RM. Adhesion testing of dentin bonding agents: A review. Dent Mater 1995;11:117-25. 24. Pashley DH. Smear layer: Physiological considerations. Oper Dent Suppl 1984;3:13-29. 25. Van Meerbeek B, De-Munck J, Yoshida Y, Inoue S, Vargas M, Vijay P, et al. Adhesion to enamel and dentin: Current status and future challenges. Oper Dent 2003;28:215-35. 26. Ayad MF, Rosensteil SF, Hasan MM. Surface roughness of dentin after tooth preparation with different rotary instrumentation. J Prosthet Dent 1996;75:122-8. 27. Gwinnet AJ. Smear layer: morphological considerations. Oper Dent Suppl 1984;3:2-12. 28. Ogata M, Harada N, Yamaguchi S, Nakajima M, Tagami J. Effects of self-etching primer vs phosphoric acid etchant on bonding to bur-prepared dentin. Oper Dent 2002;27:447-54. 29. Oliveira SS, Pugach MK, Hilton JF, Watanabe LG, Marshall SJ, Marshall BW Jr. The influence of the dentin smear layer on adhesion: a self-etching primer vs a total-etch system. Dent Mater 2003;19:758-67. 30. Spencer P, Wang Y, Walker MP, Swafford Jr. Molecular structure of acid-etched dentin smear layers- in situ study. J Dent Res 2001;80:1802-7.
nanjundasetty, j. and nanda, s. and panuganti, v. and marigowda, j.